That was first time I liked one of that guy's videos. At some point you have to get away from using the same vehicle for destruction. This was the criticism about some of the aspects of the new films, just a rehash of the original trilogy. Also it would just be seen as a rip off of the original Star Tours. So the new story aspect of the land is something I like. And I don't know why they would want to do that. They've already gotten hit with criticism by fans for TFA being basically a rehash of the original trilogy, which honestly I didn't mind. They'd get hit with even more criticism for making their new SW land exactly the original trilogy. Especially if Lucas himself wasn't involved and if something wasn't exactly right. So I'm glad they're making a new land with a new story. Recall that each stretching room must spend half its time resetting, which shouldn’t be an issue with the shuttle turntable. I expect that once one shuttleful of guests is loaded, it will rotate them away, immediately delivering an empty side of the turntable ready to accept guests. Say the shuttle holds as many guests as a stretching room. Without the need to reset, one turntable has the throughout of two stretching rooms. And just for fun, if the preshow design were up to me, I’d split the turntable into three sectors with one loading, one dwelling in a preshow, and one unloading at the same time. That way you can spend more time in the shuttle than just the amount of time it takes to spin the thing around without sacrificing capacity. I agree with your estimate of three cabins for the shuttle--it matches with the angles we have seen of the turntable/rotunda. My concern is that if it goes down, they have to use some pedestrian walkaround to keep the ride operating. I've heard a second-hand rumor that there is such a provision, but I don't know any details. Yep, everyone hates the engineers until you actually need something fixed. Here's the other thing you got to remember: There will be some people that DON'T want to steer. They'd really prefer a passive (still thrilling, but not so interactive) experience. The engineer positions could be throwing a bone to those people by simply saying, "when this button lights up, push it, and that's it." I can easily think of folks who would like to ride, but really don't want much asked of them. @TP2000, they'll be happy to give you the pilot seat. We'll the sequel trilogy is their creation. If it becomes more tainted than the prequels, they COULD go original if they wanted. I doubt they will ever do that in my opinion. But sure they COULD do anything. They COULD also just create a brand new story yet again and make it even more unique. Hey I'm new to the forum and I like the conversation that's happening and I wanted to join in with the cool kids. I can imagine that the first time people go on it after waiting the 3 1/2 hours will probably be a struggle trying to figure out how each of the controls works and "what does what" and as a result, you're going to get some people who want to go on again to make up for any mistake and get a redo. So those people or families with little Jimmy who HAVE to go on again will wait another insane amount of time for it. That's not even factoring in any time delays if the ride breaks down (which most likely will happen). It just seems like there will be a lot of unhappy people for the long waits and against little Jimmy for ruining their ride experience. I don't get it. How will Disneyland even be walkable when Galaxy's Edge opens? Opening day alone will, in my mind, be in comparison to the infamous Black Sunday minus the news reporters making out with patrons. And they'll have to stop constantly to clean up puke in the cockpits. I may go in mid July, so I'm curious about the answer to this as well. My thought is it will be plenty walkable because everyone will be afraid to show up. I was just joking since 6 of the films feature a Death Star in some capacity, it just always shows up. I'm real happy that Hondo will be part of the Falcon ride. The worst thing a tie in ride can do is force the most popular characters into places they don't belong (Star Tours vs Adventures Continue). 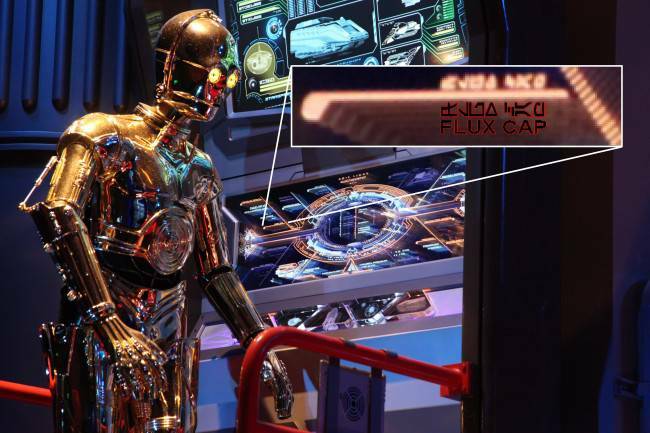 If you look at 3-CPO's control panel in the main room, you will see it mentions a certain Flux Capacitor. I’m terrible at video games, specifically racing or the driving kind. God bless anyone who has to deal with me on the first time I ride this... it will be a learning curve but I’m sure we’ll get through it. Will we be getting Star Wars branded puke bags for the rocky rides I forsee from horrible pilots?